Trade body WindEurope predicts 14 gigawatts of new installations in 2017. Europe’s total installed wind power capacity could surpass 200 gigawatts in 2020, according to a forecast issued by trade body WindEurope this week. And up to 15 percent of that capacity could be offshore, WindEurope predicted. 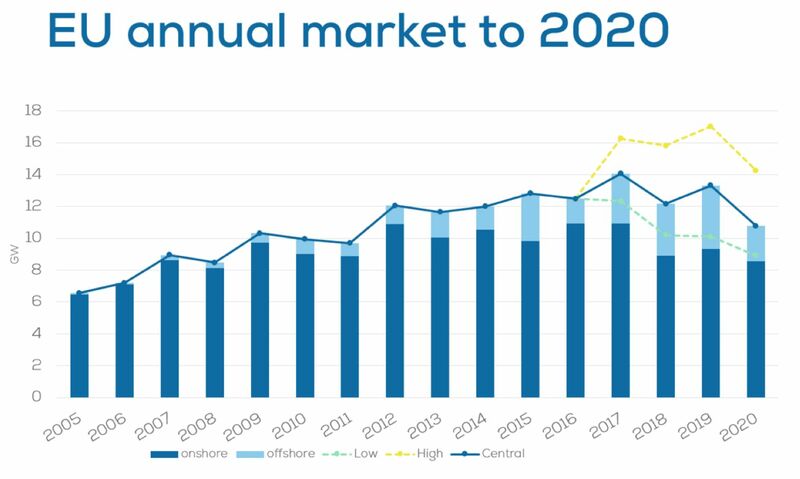 The offshore build-out, which will account for a quarter of new capacity over the next four years, will put the European Union ahead of the U.S. in terms of total installed capacity in 2020, WindEurope and International Energy Agency (IEA) figures show. 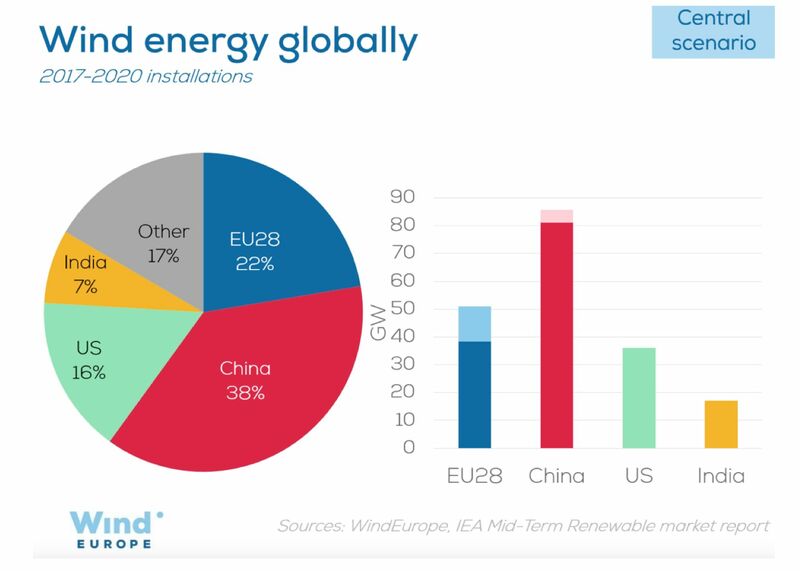 The EU will be the second largest wind market in the world, after China, WindEurope revealed. “This is going to be a huge step for the industry,” said Aloys Nghiem, WindEurope technology analyst, in a conference call. WindEurope’s 2020 outlook also predicts European capacity additions will hit an all-time high this year, with 14 gigawatts due to come on-line. The first half of the year saw 6.1 gigawatts of capacity installed, with Germany accounting for 2.3 gigawatts, or 48 percent. The U.K. added a further 1.2 gigawatts, or 24 percent, as developers raced to meet the end of the country’s Renewable Obligation Certificates regime in March. France rounded out the top three nations, in terms of new installations, with 492 megawatts of capacity. 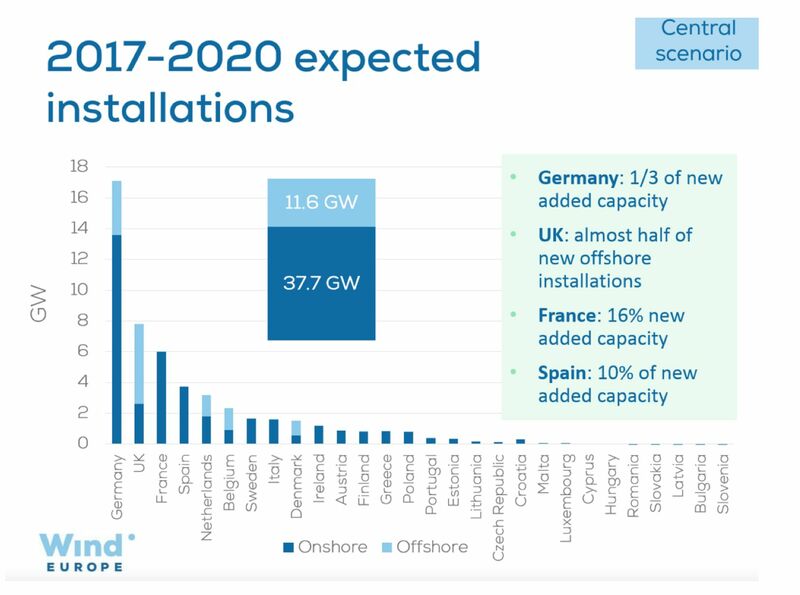 Together, Germany, the U.K. and France accounted for 80 percent of all new capacity installed in the first half of this year. And more than 1.3 gigawatts of this new capacity was offshore, tripling the level seen in the first half of 2016. 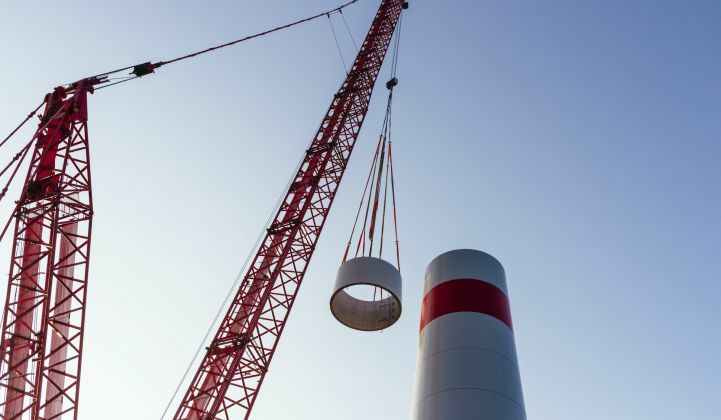 Offshore, Germany once again accounted for a leading 48 percent of new capacity, with the 402-megawatt Veja Mate project representing the majority of the 641 megawatts installed across the market. Under a "central" or medium forecast, WindEurope expects European wind installations to dip next year, recover somewhat in 2019 and drop again in 2020 as auctions run their course. Up to 50 gigawatts of new capacity could come on-line, it predicts. A low estimate, meanwhile, sees this year’s installations failing to match last year, then declining year-over-year to 2020. Under a high scenario, capacity dips slightly next year, reaches a new peak in 2019 and declines in 2020. WindEurope’s central scenario assumes Germany will continue to be Europe’s undisputed leader in wind energy, delivering a third of new capacity across the EU in the next four years. The U.K., meanwhile, will carry on leading in offshore wind, providing almost half of all new installed capacity. Another WindEurope report out this month, Wind Energy in Europe: Scenarios for 2030, predicts that Europe will have 323 gigawatts of wind generation by 2030. This implies installing 253 gigawatts of onshore wind, double the capacity today, and 70 gigawatts of offshore, a fivefold increase on current levels. By 2030, WindEurope believes that four European nations -- Denmark, Ireland, Estonia and the Netherlands -- will get at least half of their electricity from wind energy. Nghiem noted that WindEurope’s predictions were more optimistic than those offered by the IEA or the European Commission. IEA’s forecasts were made before the outcome of this year’s auctions revealed massive cost reductions in the price of wind, said Nghiem. The European Commission’s forecasts, meanwhile, assume "frozen policy," or no new moves to support wind energy. “This we don’t believe will happen,” Nghiem said. On the contrary, to achieve WindEurope’s 2030 forecast, “We expect a lot of policy to happen,” he commented. It remains to be seen what impact European wind policy decisions may have, though. MAKE Consulting’s Q3/2017 Global Wind Power Market Outlook Update, also published this month, includes a weakened short-term outlook for Europe, the Middle East and Africa, mainly because of the auction outcomes in Germany and Spain. In Germany, there is concern that community groups, which snapped up more than 95 percent of capacity in this year’s auctions, could be slow to complete their projects. This appears to have been factored into WindEurope’s forecasts. In Spain, though, some worry that the country’s frail regulatory framework may repel credible bidders in the auction process, something WindEurope may have overlooked. “The inexperience of the winning wind groups that won 1.1 gigawatts at the second Spanish auction limits upside,” noted MAKE.